Last year Golem Painting Studio ran a workshop in the run-up to the UK Golden Demon event. The gist of which was that you took along your current project (potentially your Golden Demon entry) and worked under the watchful eye of a handful of tutors to really make sure your model was the best it could be. 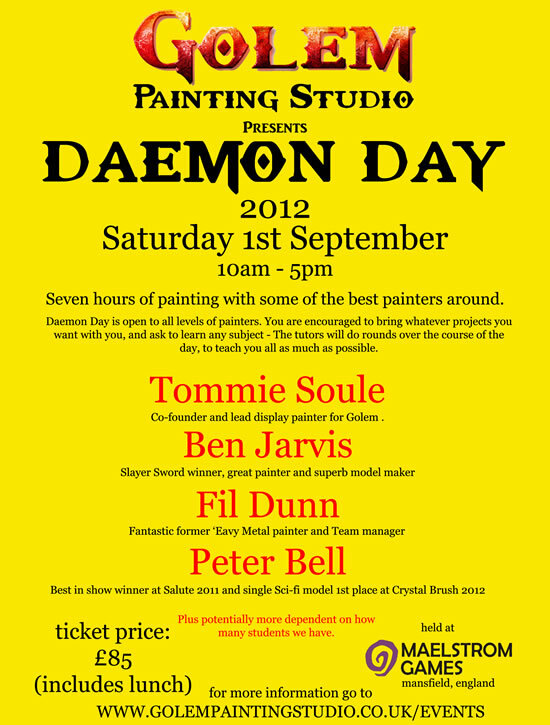 Thats right folks, I will be at the Golem event among such highly esteemed painters… so if you are entering the Golden Demons this year, or want some constructive advice on improving your painting, see if you can come along to the Golem Daemon Day. Its on the 1st September (giving you 3 weeks before GDUK to make any changes), costs £85 for the day* and is held at Maelstrom Games in Mansfield (click here for the details on Golem’s website). *including lunch, which if it is the same as the last Golem event I attended at Maelstrom will be a well stocked and rather tasty buffet in the on-site bar!